It’s hard work, but I feel like I’m making progress in my new job. And although I’m working flat out, people I’ve seen recently say I look well on it. Of course people always say that. It’s pretty rare for someone to come out and say: “You look terrible”. But most of the people I’ve met from my old work, do say I look a lot happier now than I did there. Which – given the large, in some cases huge and always myriad practical challenges in my new job – seems, on the face of it, quite surprising. Albeit they happen, my current job is dogged by far fewer ‘toxins’ than my old one. It’s not all progress. 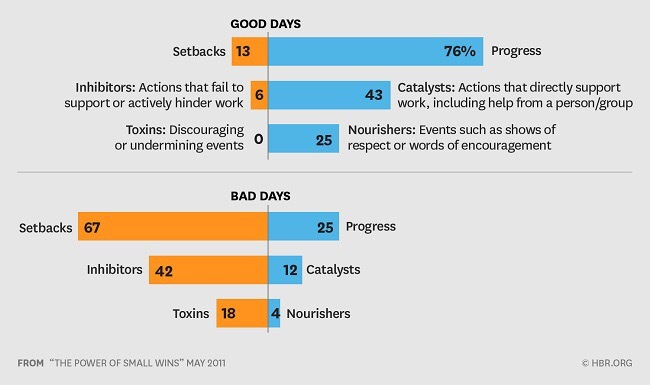 Not everyone is a catalyst; there are plenty of inhibitors around. But the big difference is there are far fewer ‘deliberately discouraging or undermining events’. What a relief – as another Harvard Business Review article pointed out this week, organisations should worry less about hiring ‘superstars’ and more about avoiding hiring ‘toxic people’. The benefits of stars are more than eclipsed by the cost of toxic folk. But the problem in my old job was as much structural as personal; it’s hard work being close to government. All organisations have politics, but stating the obvious, government is all about politics – and that means ‘deliberately discouraging or undermining events’ are part and parcel of working in or with it. I discovered this week that for all the moans and grumbles, universities have one of the highest job satisfaction scores of all sectors of the UK economy. 88% of people who work in universities say: “this is a good place to work”; only 56% do in government. Less toxins, more progress – that’s all it takes to keep me happy at work.